Mussels, salmon and oysters are culinary delicacies around the world, and they are farmed with great success in New Zealand. With its long coastline and temperate waters, the country is ideal for cultivating a variety of aquatic plants and animals, from seaweeds to seahorses. Aquaculture is the farming of fish and other aquatic animals and plants. It can take place in the sea, in lakes, rivers, and in special pools on land. New Zealand aquaculture is a multi-million dollar industry. The main species farmed in New Zealand for export are green-lipped mussels, quinnat salmon and Pacific oysters. Until the 1960s, mussels were picked by hand from rocks. In the early 1970s, techniques to cultivate mussels were trialled. The Japanese longline system was the most successful. Stockings full of mussel larvae are tied to submerged ropes, where they attach themselves and grow. Today, mussels are cheap and plentiful, and are exported to more than 60 countries. Ocean ranching, established in 1976, proved unsuccessful. Salmon spent their first two years in fresh water before being released into the sea. They were expected to return once they were larger, but few did. Sea-cage ranching was developed in 1983. Salmon hatched in fresh water are moved to large net cages in the sea. In about two years, they are ready to be eaten. Freshwater farming developed in South Island hydroelectric canals in the 1990s. Salmon are enclosed in net pens and provided with food. Rock oysters and dredge or Bluff oysters have been harvested in New Zealand, but in 1970, farmers noticed another species that had arrived in New Zealand and grew much faster – the Pacific oyster. They decided to cultivate it, and by 2001, 100 farms were producing 3,500 tonnes each year. The main threat to aquaculture is from sudden growths of harmful algae, known as toxic blooms. Coastal waters are frequently tested. More species are being trialled for farming, including pāua shellfish and sea horses, which are used in Asian medicine. 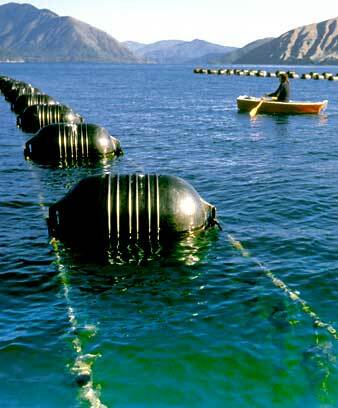 In 2004 the New Zealand government set up new laws to control the aquaculture industry and protect the environment.